In a time when we are struggling to recognise our roots as Goans and fighting to keep our identity from merging into a potpourri of cultures, we have some clarity in the form of the various cultural festivals that have been peppering the years since the beginning of the 2000s and will hopefully continue on through the years to come. We have one man to thank for this and that man is Marius Fernandes, now dubbed ‘Goemcho Festamkar’ for daring to leave a lucrative career behind and spend 17 years injecting goenkarponn into the goenkars (Goans) and their progeny. Marius was not born in Goa, but in Kenya in 1959, albeit arriving into a family that was firmly entrenched in Goan culture. Adventure seems to run in his veins since his grandfather Mathias Xavier Fernandes found himself in Kenya after spending the night on a dhow. He had been trying to escape the confines of strict convent education and had sought refuge in the dhow for a night’s rest only to find himself sailing to the continent of Africa. He adapted to an unknown culture there, making a life for himself and raising a family that would eventually spread to Canada, UK, Australia and other countries. Marius’ mother, Antoinette, is responsible for his deep love for Goa. She decided that her little brood would move back to her homeland to savour its fruits and imbibe its values. In 1968, Marius began attending Our Lady of Divar High School, but it was the community life, village events, gatherings of relatives and the singular fests of the Divar Island (Potekar, a festival celebrated before Lent, Bonderam, the festival of flags, etc) that provided much of his education and the foundation for his future as Goemcho Festamkar. 1976 saw Marius’ departure to England and soon, at the age of 20, he began working for British Telecommunications. During those years in England, however, he vowed to return to Goan when he was 40 and allow his children, Gemma and Ashley, to share in the Goan culture he loved with his whole heart. Once in Goa, Marius was elected to become the sports secretary of the St Mathias Sports Club, which ensured his time was well occupied. One of his duties was dealing with the bonderam festival. The realisation that the festival was delayed by the chief guest, paid for by a local politician and sponsored by a brand of alcohol left Marius aghast and wondering what had happened to the values of the Goa of old. 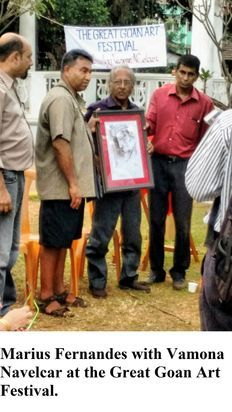 Since then, Marius has organised about 25 festivals celebrating Goan culture, without a chief guest, sponsor, alcohol or politicians. It is the village people who get together and through crowd funding set up various fests showcasing authentic Goan cuisine, drinks, arts and crafts, traditional occupations, musical instruments, indigenous plants and their uses, dances, music, and so on. The festivals have been celebrated under varying themes such as the Poderanchem Fest highlighting the skilled creations of Goan bakers, or poders, and the Ramponkaranchem Fest, celebrating the lifestyle of the fishing community and the use of the rampon (fishing net). 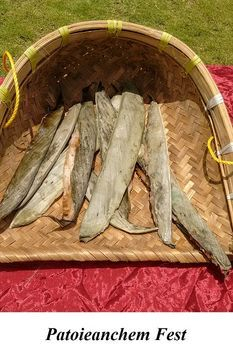 There have also been the Patoieanchem Fest with the Goan sweet preparation holding centre stage, the Ponsachem Fest with the virtues of jackfruit being lauded and the Denneachem Fest with its emphasis on giving (denem) Goan culture to people as a gift to savour. The Great Goan Art Festival revived interest in Goa’s Vamona Navelcar. Some of the festivals have brought about significant changes such as the ghumot being manufactured using goat skin instead of the banned monitor lizard skin, the innovation of the three-sided ghumot by Marius’ son, Ashley, and the resurgence of the ghumot , now becoming an instrument that is no longer segregated to the domain of male ghumot players. In fact, the ghumot is on the way to becoming the state musical instrument. Marius could not have achieved all of this without the help of stalwarts of Goan culture. Fr Santana Carvalho and the Socorro Art and Cultural Association have stood by Marius in bringing together the community in Socorro, where Carvalho is the parish priest, and celebrated numerous festivals to great success. Alexyz, Miguel Braganza, Prajal Sakhardande, Sanjeev Sardesai, and Roland Martins are faces you can see at almost every festival. Artist Clarice Vaz, Pound Pro instructor Cliszma Da Costa, singer O’luv, percussionist Carlos Gonsalves, artist Savio Godinho, Dr Glenis Mendonca and others have joined the festival route inspiring younger generations to a better understanding of their heritage. Of course, there are many more people, the ones who somehow escape attention and who should be equally applauded and appreciated for their hard work and dedication to these festivals. Their valuable contribution is, without doubt, the glue that holds these festivals together. Before retiring from organising festivals and moving back to England, Marius handed the responsibility of continuation of these festivals to educational institutions. ‘What better way to pass on the baton to the younger generation!’ says Marius. 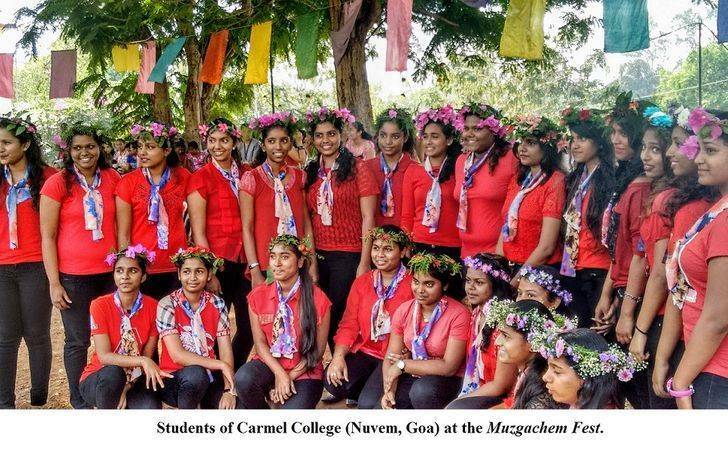 Some examples are the Muzgachem Fest at Carmel College for Women and the Aboleanchem Fest at the Nirmala Institute of Education. 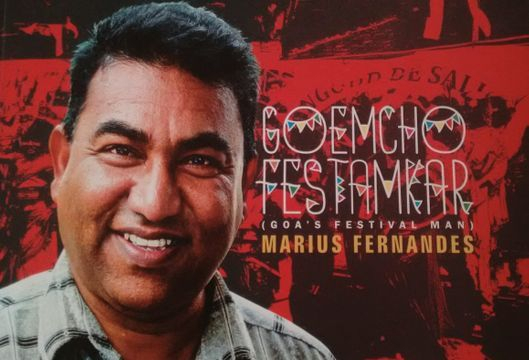 Marius’ story and his beloved festivals have been documented in a book called Goemcho Festamkar (Goa’s Festival Man): Marius Fernandes. The book holds contributions from several writers and photographers and is the brainchild of artists Bina Nayak and Clarice Vaz. It also gives advice on how to successfully organise a Goan cultural festival. The book is available on sale at the festival venues or you can contact Clarice Vaz for copies. Although Marius is not physically present at the festivals now, he is constantly monitoring their development and sustenance from afar via social media. The stage has been set. It is up to us now to carry on this torch lit by Marius, continuing with festivals that promote Goan culture, communal harmony, respect for nature, ingenuity and the values of the past.